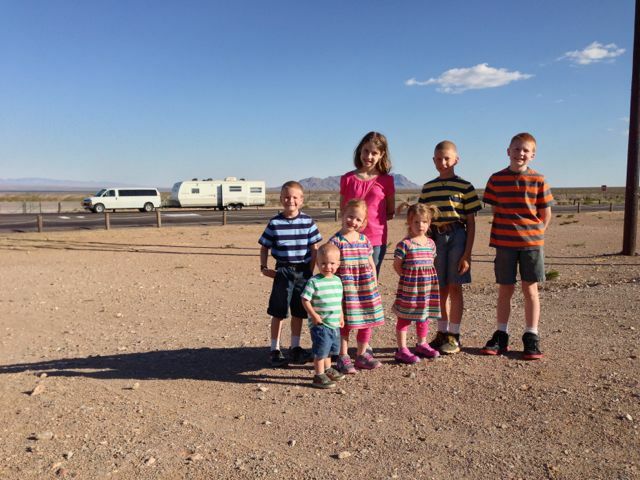 Gabe's babes: On the road! 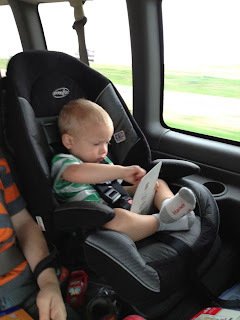 We're on the road from the South West to the Mid-west and having loads of fun along the way. 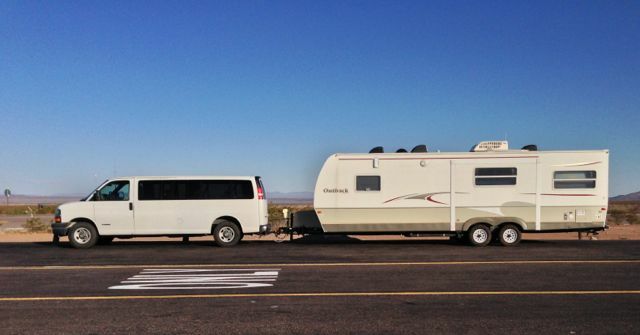 This is our first big, long road trip with the trailer. 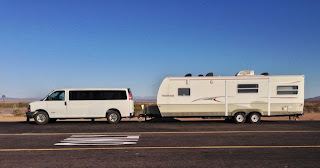 Figuring out the logistics of this sort of trip with the trailer was a bit of work, but well worth it. 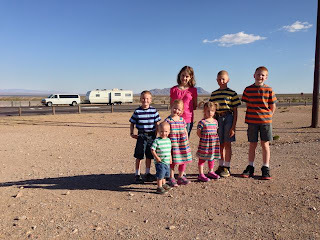 We try to spot fun rest stops and truck stops along the way so that the kids can get out and stretch their legs. 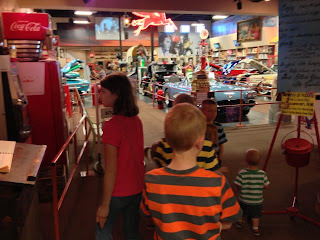 This stop had a fun, FREE, car museum. While all of the kids had fun there; Mr. K seemed to be in little boy heaven! Cars everywhere! Sometimes the stops are not quite as exciting, but it is nice to get out of the car none the less. We're trying out a new "game" along the way. Miss E suggested it after reading about it in a travel games book. The book suggested giving each child a bag of tokens (We are using little craft wood shapes). For poor behavior kids would have to hand a token over to mom, dad, or the offended sibling. The kids also earn additional tokens for behavior above and beyond what is expected (so, mom and dad each have a bag of tokens as well). 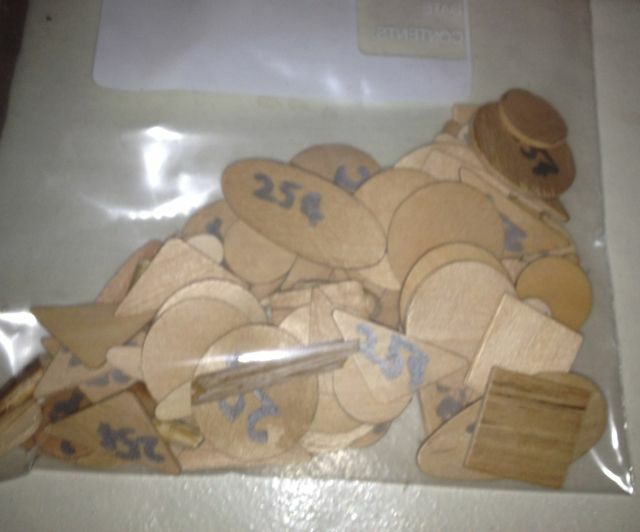 We've assigned a monetary value to the tokens (25 cents) and at the end of our trip they will turn in the tokens for cash (everyone started out with 10 tokens). We're all enjoying this little game, it is a great way to encourage and reward their good behavior and gives an immediate consequence for poor behavior as we are driving down the road. As we go along we listen to books on tape (well, they are not actually on tape. They are MP3s, most downloaded from LibriVox). We alternate between books that appeal to the younger set (animal stories), and those that are more interesting to the older group. Sometimes we listen to sermons and podcasts as well. They help the time go by, and fill our heads and hearts with good material as well! We also picked up a set of travel bingo cards for the kids to play along the way. Even Mr. K got in on that fun, he was the first to get "black out."